She even gives us a closer look! 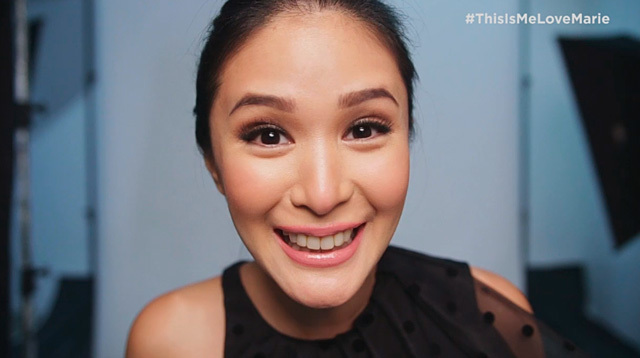 With her beauty book, This Is Me, Love Marie, officially out in bookstores and e-newsstands, Heart Evangelista's official hashtag #ThisIsMeLoveMarie has been flooded with photos from fans, and unfortunately, haters. We're talking actual accounts dedicated to bashing the actress, and proving that she had her nose, eyes, and (insert facial feature here) surgically altered. During her launch, Heart was asked by the media once and for all if she fixed anything on her face. Heart replied that she had "nothing against it [surgery]," but she really, "did not have anything done." She also posted a page from her book on Instagram (below). In This Is Me, Love Marie, she reveals, "I do have a keloid on the side of my right eye from a childhood accident (Editor's Note: Heart's mother, Cecile Ongpauco, narrates the story in the book's foreword) and a chicken pox scar on my upper lip—but not from surgery!" We will leave it to you to decide whether you will believe Heart or not. But we encourage everyone to #StopTheHate and focus your energy on something more positive—not on bashing celebrities or bringing them down. Because you know what? This Is Me, Love Marie is available in bookstores and Buqo for P295.